In wake of Israeli elections, peril and promise for stunt-making progressives. For the scrappy millennial organizers of IfNotNow, a fringe group on the progressive left that calls for the end of Israel’s occupation, last weekend was as good as it gets: Two big targets, two apparent bull’s-eye hits. 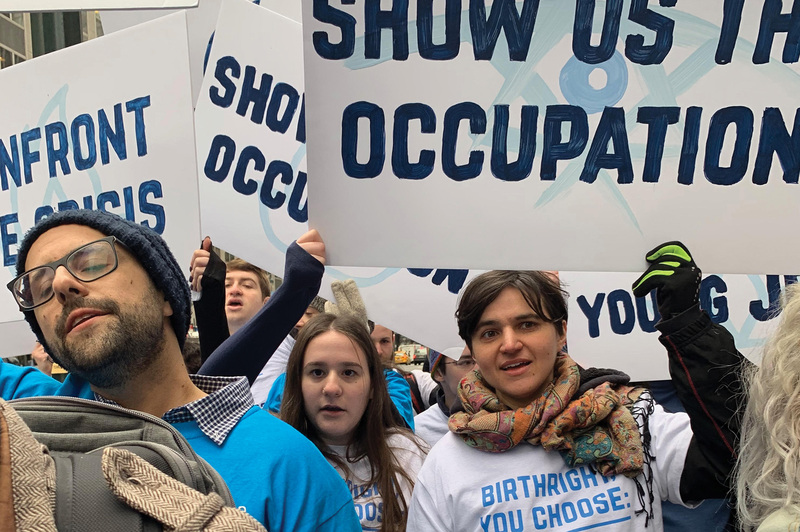 On Friday, in an act of well-planned street theater on a cold, finger-numbing morning, more than 100 members of the group shut down Third Avenue in midtown in a protest in front of Birthright Israel’s midtown headquarters. 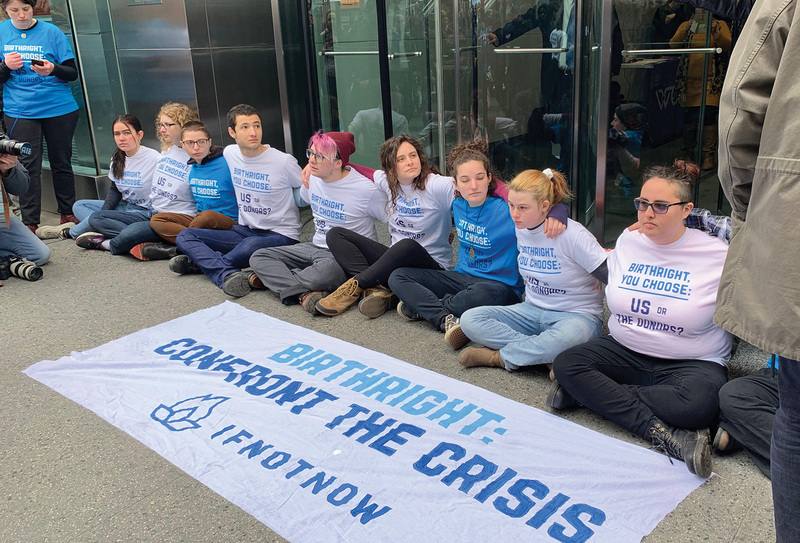 Fifteen college students, challenging Birthright to arm its young trip participants with information about Israel’s policies on the West Bank, were handcuffed and arrested. Splashy headlines and media coverage, the group’s lifeblood, followed. It’s the kind of attention the controversial organization, which operates with a small staff and a small budget, has been grabbing for a year as it has arguably eclipsed better funded and more established groups on the Jewish left in garnering attention and generating energy. But with the results of this week’s Israeli elections still unclear, IfNotNow finds itself at a moment of both peril and promise. Peril, because its goal of ending Israel’s occupation may be dealt a death blow if Prime Minister Benjamin Netanyahu can cobble together a right-wing government and move toward annexation of settlements in the West Bank. But promise, because such a move could so inflame liberal American Jews that IfNotNow, if it is savvy enough to capitalize on the anger, may find itself with many more natural allies. Should the centrist party of Blue and White party, led by Benny Gantz and Yair Lapid, be able to form a center-left coalition, IfNotNow could find itself well-positioned to capitalize on what will likely be a new injection of hope for a two-state solution, despite Blue and White’s reticence about the Palestinians. 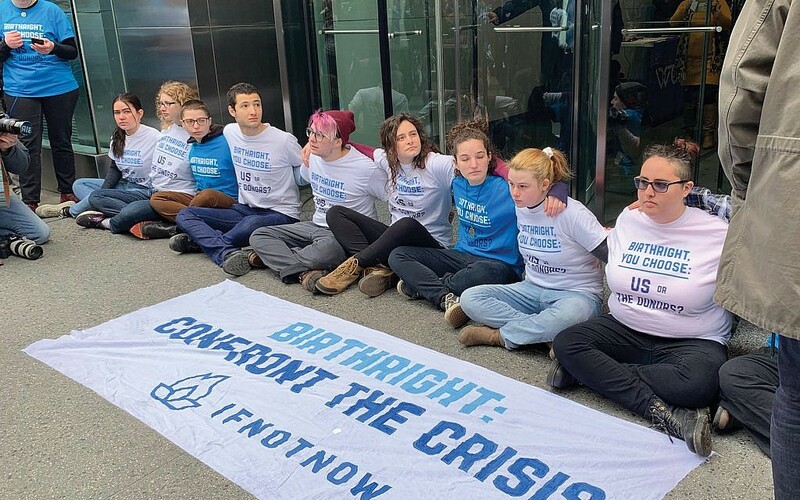 In truth, for all of its provocative actions, IfNotNow hasn’t changed much on the issue of the occupation in the wider Jewish community; its activism has opened a conversation but hasn’t really moved the needle, and its tactics may not win the group more converts. Reviled by establishment Jewish organizations, IfNotNow is criticized as well by Jews who oppose Israeli policy in the West Bank. Rabbi Eric Yoffie, the former president of the Reform movement and a self-described critic of the occupation, is troubled that while the group “makes a lot of noise,” it is silent on the issue of Israel’s right to exist. If the West Bank is annexed and the two-state solution is officially buried, IfNotNow may face an even bigger crisis than the two-state solution one: how to pivot an organization formed in response to a political reality that is rapidly changing. These kinds of questions are especially tricky for IfNotNow, an organization that has resisted taking a stance on Zionism or BDS, instead limiting its mission to ending Israel’s occupation of the West Bank. Leaders of IfNotNow believe that Netanyahu’s campaign promise on annexation could be the final straw that draws American Jews to voice their disapproval of Israel’s rightward turn. “If Netanyahu pursues policies of annexation in a more aggressive way, that will only embolden, quicken, hasten the process of the American Jewish community really coming to grips over our support for Israel and the occupation,” said Emily Mayer, a founding member of IfNotNow. At the very least, a move towards annexation of the West Bank would likely galvanize the American Jewish left in a way that it hasn’t in years. Though IfNotNow may find natural allies among groups like T’ruah, New Israel Fund and J Street, it has yet to succeed in forcing a changed policy by any of the major American Jewish organizations it has targeted, like the Anti-Defamation League or Birthright. “They’re trying to move the needle way faster than maybe what reality will allow,” said Adam Basciano, national director of the Israel Policy Forum’s IPF Atid program for young professionals. Appealing to anger and using it to draw young people to protest is a strategy that has earned IfNotNow no shortage of detractors within the American Jewish community. But dialogue hasn’t proven itself to be fruitful for IfNotNow activists, most of whom are in their 20s and have lived their adult lives with a Benjamin Netanyahu as Israel’s premier, long after the hopeful Oslo years. Many of IfNotNow’s leaders got their political education from J Street, the organization founded in 2008 that calls itself “pro-Israel, “pro-peace.” Despite its establishment trappings – it is a pro-Israel lobbying organization – J Street has struggled for acceptance among the so-called Jewish establishment, most notably in its exclusion from the Conference of Presidents of Major American Jewish Organizations. 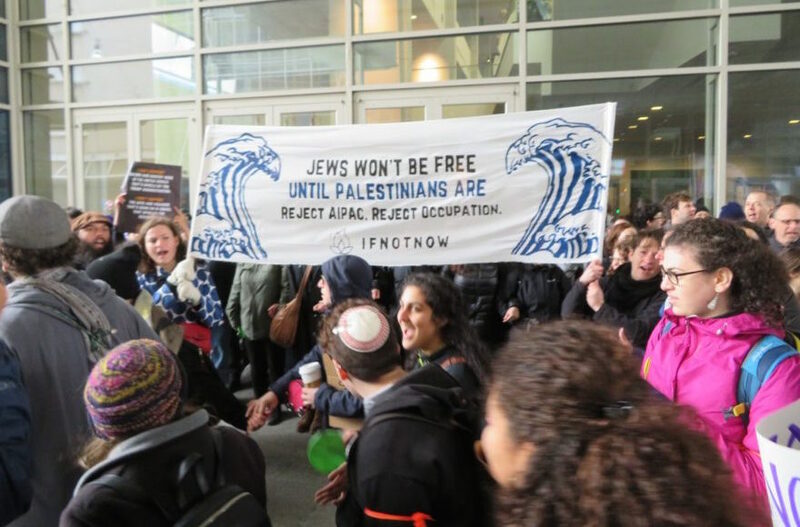 Learning from J Street’s complicated relationship with the Jewish community, IfNotNow activists decided to take a different tack, using more aggressive and public provocations to force action. Since January 2016 the group has trained 2,000 people in its provocative tactics, which have included staging walk-offs from Birthright trips, confronting Birthright participants with anti-occupation literature at the airport, bringing challah to Rep. Ilhan Omar’s offices in Minneapolis and Washington after she tweeted a number of statements that most of the rest of the Jewish community took as anti-Semitic, and reciting the Mourner’s Kaddish in front of the Presidents Conference offices here during the 2014 Gaza war. IfNotNow says some 10,000 people have taken part in actions and meetings. No matter how effective their tactics are — or aren’t — in changing American Jewish organizations’ posture towards Israel’s government, leaders of IfNotNow promise that they’re not going anywhere.